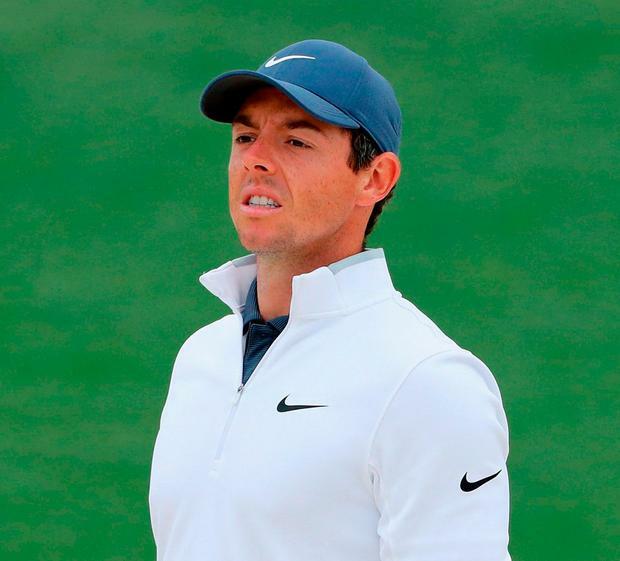 As he gets ready to tee up at Augusta today, Rory McIlroy insists he doesn't want his career to fizzle out before he's 30 - admitting it's time to "get a move on" in adding to his Major tally before time runs out. The Holywood star turns 29 in four weeks' time and after going four years without a Major win, he feels the clock is ticking. Set to begin his chase for a fifth Major and that elusive Green Jacket alongside Spain's Jon Rahm (23) and 2013 winner Adam Scott (37) today, McIlroy said that his ambition is to win more Majors and "just keep adding to the list". The World No 7 - who tees off at 6.38pm Irish time alongside Scott of Australia and Rahm - told NBC: "I don't want to be the guy who fizzled out before he was 30 and not win another Major. I want to make the most of these years that I have. "I want to put my name alongside the likes of Tiger (Woods), Jack (Nicklaus), Arnold Palmer, Ben Hogan. "But I know I need to get a move on - I haven't won a Major in the last four years. "If you look at the history books and look the other guys that have been very successful, everyone sort of has them in a 10-year span. "My first one was in '11 so hopefully, that 10-year span can go a little bit longer. I realise that this is the time that I need to start making hay and going for it." McIlroy is attempting to become just the sixth player in the history of the modern game to win all four Majors, joining Gene Sarazen, Hogan, Gary Player, Nicklaus and Woods as one of the game's immortals. Far from trying to deflect attention away from what would be a momentous achievement, he's happy to embrace the challenge, insisting: "You have to. You have to embrace it. You can't shy away from something that is staring right at you. "I know if I achieve the career Grand Slam, it (means joining) a list of five guys, the best ever in this game which is so cool." Asked what a Masters win would mean to him, he paused for a moment and said: "Everything?" The Co Down man had a four-stroke lead entering the final round at Augusta National in 2011 but crashed to an 80 and ended up tied for 15th. He admits he was fighting "demons" when he returned in 2012 and trailed home 40th behind Bubba Watson. Now McIlroy insists he feels far more comfortable at the course and followed a 25th-place finish in 2013 with four consecutive top 10s. He said: "I am very comfortable. I really am. It took me a few years. I think the best chance that I had in '11, I was still uncomfortable and that was apparent on Sunday. "I definitely had my demons going to back to Augusta after '11. You have to get over it and I've played pretty well since that point." McIlroy believes he's happier than ever, comfortable in his own skin and back to full fitness after last year's injury woes. "I feel like I am in a really good place right now," he said. "When you feel you are in that space, it allows you to concentrate 100pc on being that golfer you want to be and being successful and being as prepared as you possible can to win each and every event that you go to." McIlroy has a chance to make history at Augusta but does not believe he will be distracted by the enormity of the challenge. He said: "Any time that I have been in contention for a major I haven't been thinking about history. I have been thinking about shooting the best score to win this golf tournament and then let it sink in later."